There are several definitions for the word talisman. These include the following. This article looks at people who have an inspiring effect on teams. Willi Railo, the Norwegian sports psychologist, used another name for such people. He called them cultural architects. Looking at sports teams around the world, he named David Beckham as such a person. Cultural architects have a strong influence on other athletes in teams, said Willi. They have self-confidence and transmit this confidence to others. These architects are powerful. So it is important that they align their efforts to help the team achieve its goals. Looking back, can you recall a situation when such people had a positive influence on a team? They may have been individuals or a group of people. They could have been in a team that you were part of or one that you have heard about. What did the person or people do to shape the team’s approach? How did they act as good models? 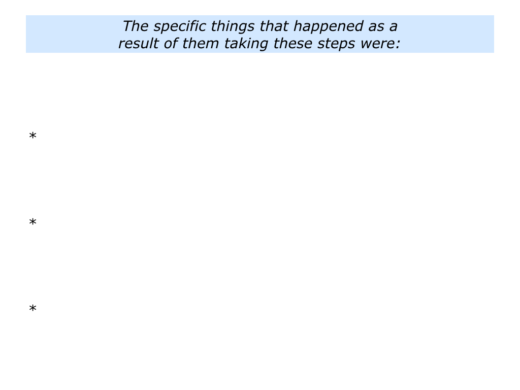 How did they behave? What kinds of phrases did they use? What did they do to keep the team on course, especially after setbacks? 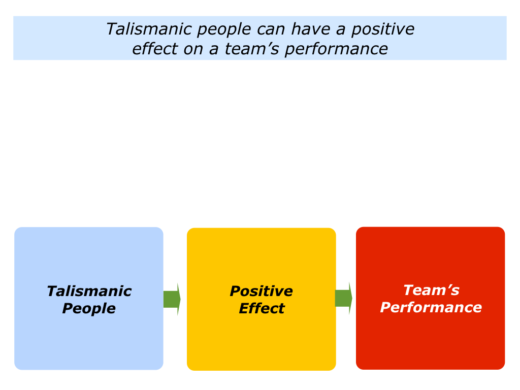 Describe a specific situation in the past when talismanic people had a positive effect on a team. Describe the specific things they did to have a positive effect on the team. Imagine that you have been invited to lead an organisation and shift its culture. Your aim will be to build a positive environment in which motivated people can achieve peak performance. There are many approaches to making this happen. One approach is to take the following steps. This involves using Appreciative Inquiry. You can invite people to recall when they have performed brilliantly in the past. They can clarify the principles they followed then and how they can follow these principles in the future. This approach often works. It encourages people to build on their strengths and successful patterns. You can discover more about it via the following link. One soccer manager, for example, shifted a club’s culture by signing positive leaders. These were experienced players who had credibility. They also demonstrated the professional standards required to achieve success. The manager then invited the players to choose whether they wanted to deliver these standards. Some chose to improve and up their game. Some chose not to deliver the goods and moved on. How to recognise such talismanic people? You can start by ensuring they have the character and competence required to deliver the desired concrete results. You can then encourage them to behave in ways that have a positive effect on the organisation. Good leaders recognise that it is important to give people context and explain the big picture. They then give people the chance to decide if they want to contribute. How to make this happen? One approach is to start by explaining the organisation’s strategy to people. It is then to build on the people who want to contribute towards achieving the picture of success. Imagine that you are addressing everybody in an organisation. You might say something along the following lines to explain the way forward. You can then invite people to reflect and decide if they want to follow the core principles. If so, they can make clear contracts about how they wish to contribute towards achieving the picture of success. Imagine that you are leading an organisation. Some of the people may be positive, some may swing between being positive and neutral, some may be negative. “Reward the behaviour you want repeated,” is the motto in organisations. So you encourage the positive people. You can, of course, give everybody the chance to decide if they want to follow the principles. When in doubt, however, you can give extra encouragement to the people who are prepared to be positive and deliver the required professional standards. To make their best contributions to the organisation. Such people can have a talismanic effect on others. 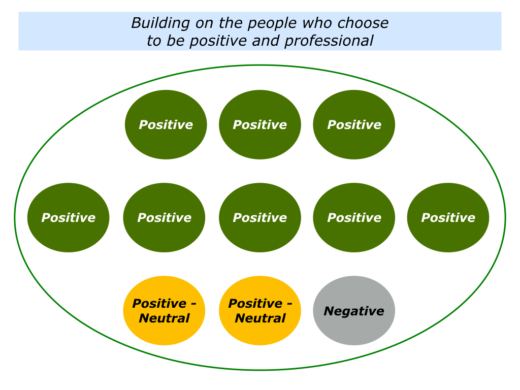 The positive-neutral people, for example, may choose to follow the required professional standards. The people who choose to remain negative will then need to move on. You can discover more about how to help people to build on their strengths via the following link. This covers many of the aspects involved in building super teams. It also includes a section on how to make clear contracts with people about their best contributions. You can keep sharing success stories that show people what good looks like. Such stories can describe real examples of when people have followed the principles and contributed towards achieving the picture of success. These stories can inspire people to do superb work. They can have a talismanic effect of encouraging others to deliver these professional standards. You can discover more about this approach via the following link. Great organisations have leaders who build a positive culture. They also have many other key people who embody the organisation’s core principles. These people act as good models and custodians of the culture. 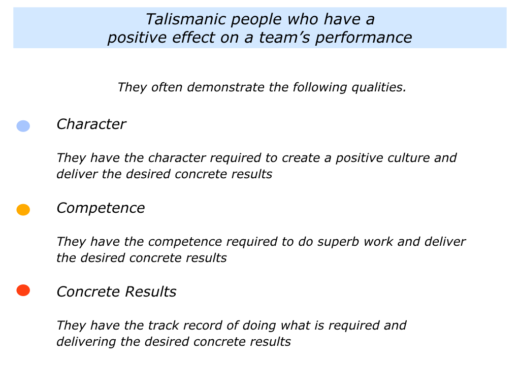 One approach is to employ talismanic people who have such high standards and also encourage others to deliver the goods. Describe a specific situation in the future when you may want to employ talismanic people and encourage them to have a positive effect on a team. 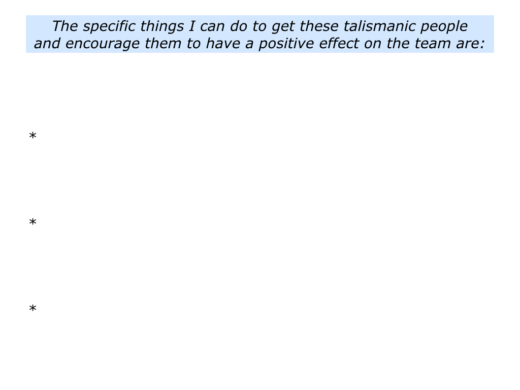 Describe the specific things you can do to get these people and encourage them to have a positive effect on the team. 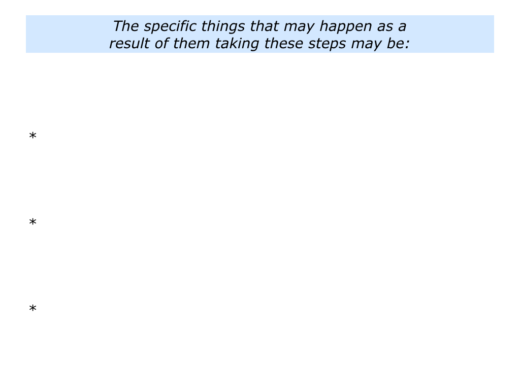 Describe the specific things that may happen as a result of them taking these steps.